I’ve only just recently dipped my toes back into the world of games and boy do I have some catching up to do! One of the things I missed out on was a line of games called “Absolute Dice.” Then again, that might also be because the game seems to be more popular in the UK than the US. But hopefully the subject of today’s review just might change that! The game’s popularity since it debuted in 2016 has spawned numerous variations: there’s a word version, a drinking version, a Christmas version and of course, a Halloween version. I tried to get a photograph of the nifty branded plastic bag the game came packaged in, but it defied all of my attempts to photograph it without the reflections coming off the clear plastic portions of the bag ruining the shot. The dice originally came in a resealable plastic bag packaged inside the velvet drawstring bag, but it’s really up to you if you want to keep using it. The rules are simple: Players roll two black dice to determine what Halloween icons they need to collect and the number of turns they have to roll the orange scoring dice. For example, let’s say I roll a ghost and the number four. This means I have four turns to roll the dice to see if I get any ghosts. Each ghost I roll gives me one point. If I end up rolling a silver ghost, I get a point for that die and double points on all other ghosts I rolled for that turn. Rolling a golden ghost nets me triple points on all the ghosts I roll for the turn, in addition to a point for the golden icon itself. Something special happens when you roll both golden and silver icons, but you’ll have to get the game to find out! The game continues until one player scores one hundred and one points. But you’re welcome to make up your own house rules and the official Absolute Dice website includes some alternate rules as well. If you notice the black “Absolute Dice” tag in the above picture, that’s not just there for show. It’s actually a folded card which contains the rules! I had no trouble reading it, but you can print out a larger version from the game’s website if you so desire. Due to the size of the dice, this game is not suitable for children under the age of five. However, the only minimum number of players you need is two. That’s right, there’s no maximum number of people who can play! The game is easy to understand and is great for people who just want to jump in and start playing. I tested the plastic dice and they didn’t seem to favor any particular side. The smooth edges of each engraved die means they will roll for awhile, so be sure to keep that in mind if you’re playing at a small table. Especially given how fast and furious dice rolls can be when players get drawn into the game! 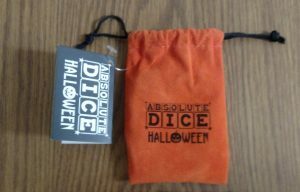 So skip bobbing for apples and bring Absolute Dice Halloween to your next Halloween party. The bag easily fits in your pocket, even when filled with the dice, so bringing the game along on trips (or to a friend’s house) is not problem at all. It sure beats carrying a traditional board game around. Similarly, rolling festive dice with family and friends is much more fun than gargling their backwash while trying to bite an apple! Special thanks to Absolute Dice for the review copy!